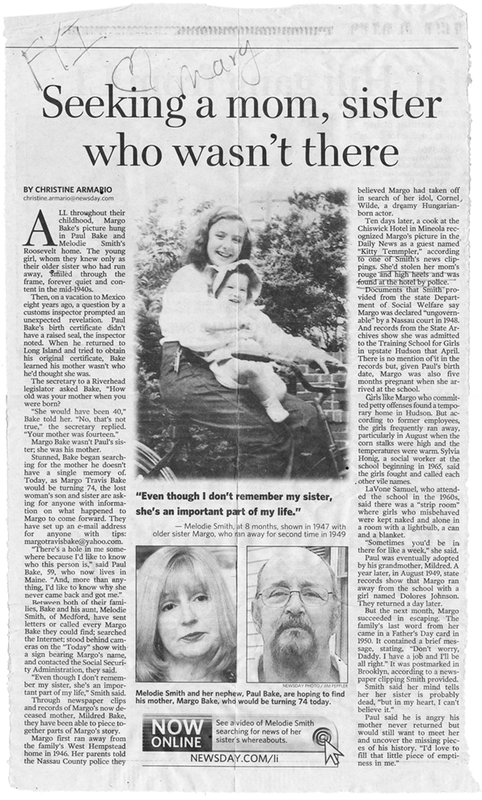 According to this undated article from Newsday, a newspaper based in Long Island, NY, ‘Missing Person’ Margo Bake, ran away from the NYS Training School for Girls in 1949. She was 5 months pregnant when she was admitted to the reform school, having been declared “ungovernable” by a Nassau County court in 1948. She was 14 when she gave birth. She ran away from her home in West Hempstead, NY for the first time in 1946. Much appreciation to Hudson resident Paul Barrett for bringing this undated Newsday article to our attention.